The Beaches in Fernando de Noronha Island. 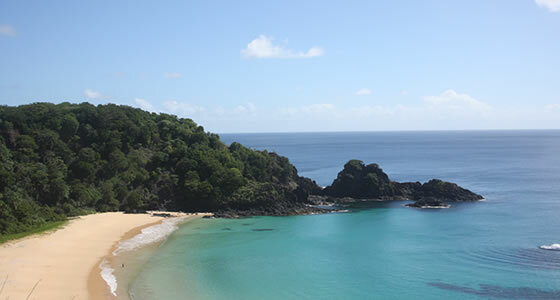 Nine of the Top Ten Brazilian beaches are located in Fernando de Noronha. There are over 20 beaches around the main island. Many are perfect for families and guests to swim and relax in. Some however, can be quite treacherous and should only be frequented by experienced surfers or scuba divers. This is a favorite spot for diving. The beach itself is circled by a rock wall. This wall is a popular roosting site for many of the sea birds in the area. It is considered one of the 10 most beautiful beaches in Brazil. As there are no major coral formations, boats can actually stop here so passengers can swim. The steep cliff is accessible by ladders fixed in the rock and stairs carved into the stone. This beach is usually the busiest on the island as it is so easy to reach. It is known for its great surf and natural beauty. During low tides the waves calm and beach goers can easily walk the sand bar. There are few drinking establishments on the beach so visitors will not go thirsty . This beach is popular with surfers and is included as one of the primary locations for the international and national surfing contests. It is one of the longest beaches in the area. From this beach sun worshippers get a great view of Morro Dois Iramos, the Two Brothers Rocks. This beach, also known as Dolphins Bay sits behind Sancho Beach. The area is off limits to swimmers and boaters. It is home to spinner dolphins. A trail leading to the top of a cliff allows hikers to watch the dolphins from the top of the rock. Pigs Bay is very popular with tourists. Natural pools form between the rocks and there is a direct view of Two Brothers Rocks. The pools are filled with colored fish. It is difficult to get to this beach and visitors must scramble between rocks. This beach is next to the island’s primary port. The beach is quite small but is very calm and has some of the best views of the sunset. The supply boats unload their cargo here. This beach is located near Santo Antonio Fort, one of the first forts on the island. Fishing and tourist boats leave from this bay daily. Coral reefs are found in the waters surrounding this beach. Considered one of the most beautiful places to scuba dive, the waters are very turbulent and can be dangerous. Looking up into the cliffs beach goers can see the Sao Pedro do Boldro Fort. Lion’s Beach is considered one of the most beautiful in all of Brazil. It is a bit difficult to reach as it is past the Xareu Dam. Its name is from a rock formation that resembles a sea lion. Another rock formation, Viuvinha Mount is filled with sea bird nests. Evidenced in the distance is the Bom Jesus do Leo Fort. Sea turtles come ashore on this beach to lay their eggs. Under strict environmental control, no one is allowed on the beach after 6pm so the turtles will not be afraid to come ashore to lay their nests.